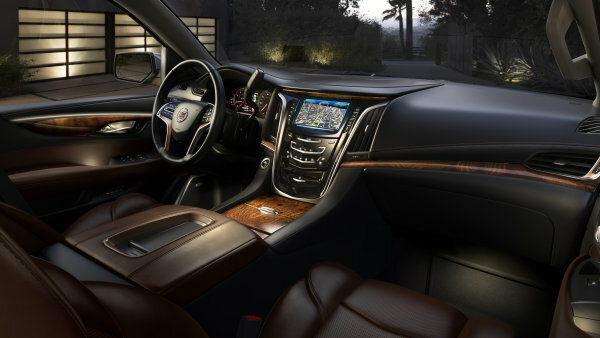 General Motors has offered up the first glimpse of the interior of the upcoming 2015 Cadillac Escalade and while we can only see a small portion of the front seats and a angled shot of the dash – this one image shows that the next generation Escalade will offer new levels of luxury with a design similar to that found in the rest of the premium vehicle lineup. While this sole image of the 2015 Cadillac Escalade interior doesn’t show us any portion of the rear passenger area, which will likely offer as much high tech luxury as the front seats but we do get a very good look at the front of the cabin. The Caddy in the picture is sporting a great looking two tone interior with dark brown leather on the seats, center arm rest and door panels while black leather with brown contrasting stitching is spread across the dash, on the top of the doors, around the steering wheel and on the sides of the central “waterfall” shaped center stack. There is also great looking wood veneer across the middle of the dash, in the door panels, in the steering wheel spokes and over the cup holders and storage areas in front of the center arm rest. Much like the other current Cadillac products, the 2015 Escalade will have touch sensitive controls in the center stack for both the climate control system and the sound system. These touch “buttons” are accompanied by a big, bright touch screen mounted high on the dash and for those drivers who don’t want to take his or her hands off of the wheel, there is also a great many buttons for both the sound system and the adjustable driver information center…which uses a high tech thin film transistor (TFT) display that is also used in other current Cadillac vehicles. Adding that little extra special something is soft LED lighting around the inner door pulls and in the foot wells. Finally, the 2015 Cadillac Escalade interior image shows a small portion of the front passenger seat base and bolster and in addition to what appears to be very plush, soft leather – we see heavily sculpted seats that not only look great, but they should also be among the most comfortable vehicle seats available in the US market. This latest “teaser” image of the 2015 Cadillac Escalade shows us more than any images or videos before but the interior is very much what I would have expected. The real mystery rests in what the full exterior design will look like. If you missed our original piece highlighting the exterior teasers, click here! The 2015 Cadillac Escalade will make its grand debut next Monday, October 7th in New York City, at which point we will have a full top to bottom, inside out look at the new super premium American luxury sport utility vehicle. With Cadillac’s upscale move in an effort to better compete with the likes of BMW, Mercedes and Lexus, I fully expect that the next generation Escalade will leave literally nothing for luxury SUV buyers to ask for in fully loaded form. The current generation of the Escalade is mighty impressive but in terms of luxury amenities, material quality and high technology gadgetry – the 2015 Escalade should set the standard by which all other luxury utility vehicles are compared. In just 6 days, we will know how high that bar has been set. Stay tuned.